Since I broke my wrist at the end of last year, I have been on cake rest. I haven’t been able to bake a thing, let alone decorate anything. With Valentine’s Day coming up, I decided to try to make something but it had to be simple. I settled on brownie hearts, each decorated a bit differently. Pretty simple stuff but effective. They reminded me of Pop artist Jim Dine, who spent much of his career using hearts as subject matter for his paintings. What do you do on a rainy day when you feel like making cupcakes but you kinda feel like throwing some icing around and not doing some serious decorating? Jackson Pollock-inspired cupcakes, that’s what! This cake was made for a designer whose favourite artist and designer was Erté. I’ve always loved pop artist Robert Indiana’s iconic LOVE image. My partner Richard and I went to the Farnsworth Art Museum in Rockland, Maine a few years back and saw two large LOVE sculptures Indiana did that sit in the gallery’s gardens. I know the artist lives near there, just across the water on an island. At any rate, I was inspired to do a small cake for us for Valentine’s Day based on this classic typography.
. Vincent Van Gogh’s Starry Night painted with buttercream icing. 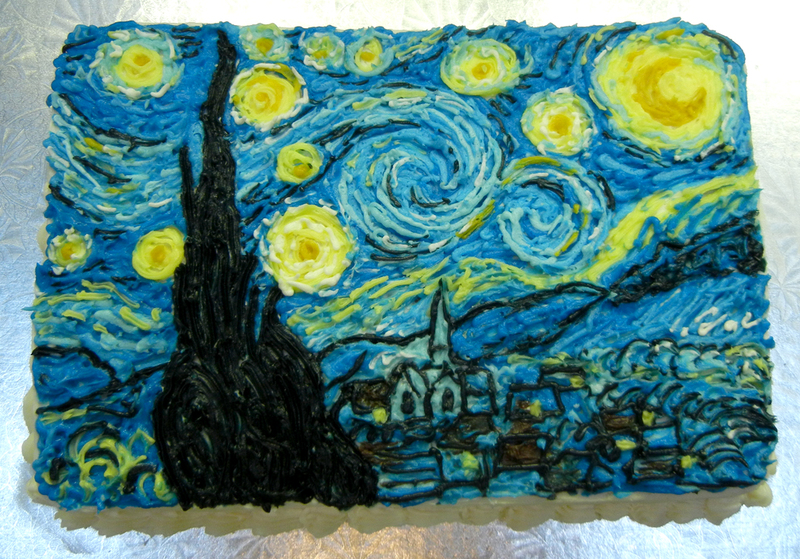 This cake was for a birthday celebration of a former art history professor at McGill University. When he opened the box, apparently he said, “She nailed it!” My art history teacher would be so proud. This lovely couple who live out in the country decided, after 17 years of living together, to tie the knot! Their annual outdoor get-together party was a big surprise to the 30+ guests because this year it was a party to celebrate their marriage. Since they love farm living, it was decided that a cake made to look like Grant Wood’s iconic farming couple, would be an ideal image for their cake…with a few modernized touches, natch!